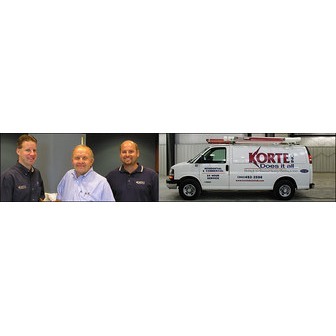 KORTE opened its doors in March 1965 providing residential electrical service. Since then, we have grown to include Heating, Air Conditioning, Electrical, Security Systems, Home Entertainment, Kitchen and Bath Remodeling, Plumbing, Sewer and Drain Cleaning for residential and commercial customers. We have worked with the following local companies: Windsor Homes, Speidell Homes, Colonial Homes, Farmington Homes, Brown Construction, Walgreen's, Casa Restaurants, Windsor Oak Apartments, Dawson's Creek, Anchor Room. Autumn Ridge and Chestnut Hills Golf Courses, Hockemeyer-Miller Funeral Homes. D.O. McCombs Funeral Homes, Babies 'R Us, Roller Dome North, and Canterbury Green Apartments. Our goal is to continue to grow and to service our customers with the best professional and up-to-date technical knowledge and equipment available. The quality of our employees and experience of our technicians is what sets us apart from the competition. While our service professionals are in your home or business, you can be assured that they will work quickly to restore comfort to your total home or business. Our staff is fully trained to work on today's wide range of heating, cooling, electrical, plumbing, drain cleaning, and sewer systems. We take pride in doing the job right the first time. We stand behind all of our work. Working as a team provides our customers with fast and efficient service and installation. Everyone from the sales team to the installation crews work together to provide our customers with quality service at affordable prices. .
We pride ourselves in providing the best service available. A telephone call will quickly bring an experienced member of our staff to your home to solve your heating, cooling, electrical or plumbing problems; or to perform regular or routine maintenance. You can depend on us for prompt reliable service, preventive maintenance or repairs. Today's high-efficiency systems can pay for themselves in a few short years. We can check your system and determine whether an energy-efficient replacement system could save you money in operating costs. Our experienced professionals will assist you in determining the best, most cost effective system for your year-round comfort. When you decide to install a system that is both right for your budget and home, we will install that system quickly and efficiently. A new energy-efficient system and professional installation are investments in your business or in your family's future comfort. Korte offers an affordable, annual preventive maintenance program. For one low annual charge we will service your heating equipment in the heating season and your air conditioner in the cooling season. This will keep your system operating at its maximum efficiency. Your home or business is one of the most important investments you will ever make. Our trained professionals can suggest solutions that will give you warmth, cooling, proper humidity and air cleaning, while providing a healthier environment for your entire family or all of your employees.